The lighting in your home can influence how you and your guests experience each room. Wall sconces are a very popular light fixture for bathrooms, hallways, and bedrooms, and they can also be used to accent other living spaces as well. While these fixtures usually don’t work well as the main light source in a room, they can help add style and light to smaller spaces. If you’re considering buying wall sconces for your home, there are a variety of lighting options available. In this blog, we’ll look at some popular sconce styles so you can be well prepared when it comes time to start shopping. At the Lighting Concepts Showroom in Trussville, we’re proud to offer a large selection of decorative sconces in our Alabama lighting showroom. Visit us today to browse for sconces, ceiling lights, lamps, and pendants, or browse our Lighting Catalogue online today! As you may already know, wall sconces come in a variety of shapes and styles. Some sconces are made specifically for up lighting, which means the bulb in the fixture is designed to face up. This can be a very popular sconce option because it can make the rooms in your home appear larger. Down lighting, on the other hand, is when the light bulb in the wall sconces faces down. This can make rooms feel more cozy and grounded, and can be a nice option for any space that needs more illumination. 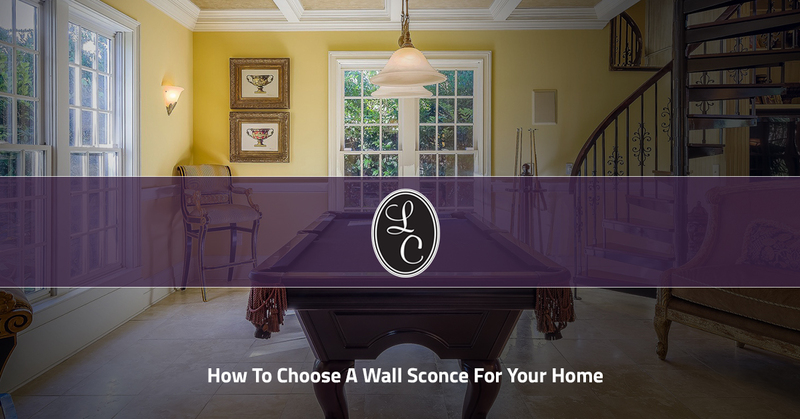 Let’s look at some popular types of wall sconces below! If you live in an older home, traditional wall sconces may be a great lighting option for you. These sconces come in styles that feature ornate detailing, which often reflects lighting styles of the past. Some popular elements of traditional wall sconces include tiffany shades and crystals, which can reflect light in unique and beautiful ways. These types of sconces can add an upscale feeling to any interior decor. If you live in a newer home, you may want to consider installing modern wall sconces in your kitchen, dining room, or master bedroom. These sconces offer a sleek and streamlined feel, and they often feature polished silver-colored metals. If you’re looking for a more minimalistic design, you may want to consider adding contemporary sconces to your interior decor. These sconces often feature a toned-down version of traditional sconces, and they can fit in most decor styles. If you’re having trouble finding the perfect sconces for your home, visit the Lighting Concepts Showroom in Trussville today!